Thanks to reader Julie for emailing me this find! 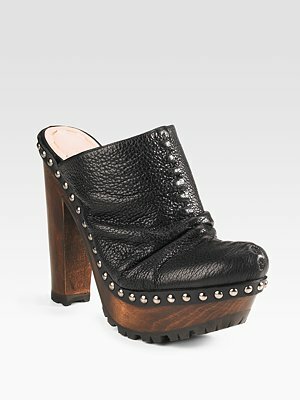 Miu Miu's pebbled leather clog retails for $495 at Saks. These Marciano clogs have a thinner heel but will give you an inspired by look for less. They retail for $167.95 at Endless and also come in brown. Click on the photo below to purchase. I am actually really into Miu Miu right now - I have to admit that before this season they werent really on my radar. I actually just did a DIY tutorial on a Miu Miu runway inspired tank.